Manufacturer of a wide range of products which include chiller room. We are the prominent manufacturer of cold storage in the market that includes Chiller Room. Low consumption of electricity, low maintenance, spacious, easy to install, sturdy and robust construction and many such features are finely inculcated in these products. Our team of professionals is very keen of customer specification and they follow the strict industrial norms and standards while designing these storages. Above all these storages are made available at their best rates. Walkin cold rooms are industrial sized fridges for storing large volumes of foodstuffs or other perishable supplies at a constant temperature. 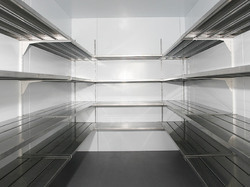 In contrast to cabinet fridges, walk in cold rooms have a door which goes down to floor level and allows a person to completely enter the room to reach stock which will typically be stored on shelving on side and/or rear walls. Looking for Chiller Room ?